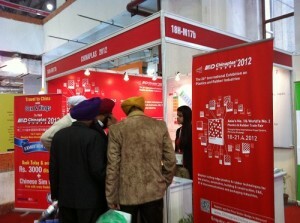 CHINAPLAS 2012 is approaching to its final countdown, a series of promotional activities have been carried out in full swing by the organizer. With its great influence in the plastics and rubber industries, together with the flourishing development of the application industries and also the green policy promotion of the 12th Five-year Plan, CHINAPLAS 2012 has become the focal point of the global industries. It is expected that the number of visitors this year will hit 100,000, refreshing another new height in addition to the records of exhibition scale and the number of exhibitors. CHINAPLAS 2012, Asia’s No. 1 and world’s No. 2 plastics and rubber trade fair, will grandly return to Shanghai from April 18 to 21, staging at Shanghai New International Expo Centre. To maximize the exposure of this mega show, the Organizer has been showing up in various relevant international exhibitions over the past few months, including South Korea, India, Japan, Russia, Thailand and Turkey. These initiatives have successfully brought the first-hand show news to the visitors there and recruited a large number of overseas trade buyers to pre-register as visitors of CHINAPLAS 2012. The organizer’s tremendous promotional effort together with the staunch support from overseas media and travel agents will help to boost the number of overseas visitors to a large extent. In order to strengthen the relevancy of CHINAPLAS with its application industries and to introduce relevant exhibits and exhibitors applied in each different industry, the organizer has organized a user industry conference in Shanghai in November 2011, in which over 100 representatives from plastics industry associations, user trade associations and end-user enterprises from various application sectors had demonstrated their support to CHINAPLAS 2012. Due to the overwhelming response, the organizer will hold two additional conferences in Fuzhou and Guangzhou in the coming month to meet end user associations and local key buyers from various industries. In addition, CHINAPLAS also showed its presence in over 20 activities in the past few months, such as annual meetings, seminars and forums held by different industries’ media and associations, covering sectors of automotive, plastic profiles and windows, plastic pipes, chemical construction material, plastic pallet, new materials, casting films, medical equipment and automotive electronic technologies, etc. This not only enabled the organizer to know more about the demand of users from different industries, but also allowed buyers to receive the most updated show information and relevant technologies. According to the organizer, a large number of end user associations, key buyers and trade media have showed their keen interest in organizing delegation to visit CHINAPLAS 2012, including Shanghai Plastics Industry Association, Ningbo Plastics Industry Association, Shantou Plastics Industry Association, Suzhou Plastics Industry Association, Hunan Plastics Industry Association, XinJiang Plastics Industry Association, Yunan Plastics Industry Association, China Electronics Chamber of Commerce, Suzhou Integrated Circuit Industry Association, Danyang Automobile Component Industry Association, Medical Plastic Professional Committee of China Plastic Processing Industrial Association, Wuxi Die & Mould Industry Association, Cixi Mould Association, etc. Meanwhile, a number of overseas trade associations from Egypt, India, Jordan, Philippines, UK, Ukraine and Vietnam have also expressed their interests in organizing buyer groups. Such strong response greatly reveals that CHINAPLAS 2012 has been well recognized by the industry and supported by numerous trade associations over the world. As the exhibition scale is ever expanding together with the number of overseas visitors, the organizer has actively cooperated with many travel agencies from all over the world as stragetic partners, including Algeria, Brazil, Canada, Colombia, Finland, India, Indonesia, Iran, Korea, New Zealand, Philippines, Russia, Taiwan, Turkey, USA, UK and Vietnam, to promote CHINAPLAS 2012 and provide all around transport and hotel services for overseas exhibitors and visitors. Till now, travel agents from Brazil, India, Indonesia, Turkey, etc., have already confirmed to organize delegation to visit the show. Overseas visitors from over 120 countries or regions have already pre-registered online, with the top 10 countries or regions being India, Taiwan, Pakistan, Indonesia, Hong Kong, Malaysia, Iran, US, the Philippines and Brazil. A number of famous leading enterprises, e.g. Hangzhou Wahaha, Philips, Tyco Electronics, BYD, Qingdao Hongda, Panasonic, Inner Mongolia Yili, BMW, Rexam, Honda, 3M, Parker Hannifin, Mitsui Plastics, Schneider Electric, Mitsubishi, have already registered to visit this international industry event. The total exhibition area is expected to hit a new record high of 200,000 sqm. Over 2,600 exhibitors from 35 countries and regions together with 13 country/region pavilions from Austria, Canada, France, Germany, Italy, Japan, Korea, PR China, Taiwan, Thailand, Turkey, UK and USA will gather under the same roof to showcase their diversified chemicals and raw materials and over 2,500 sets of machines. A number of prestigious enterprises have already confirmed their large exhibition areas. They include chemicals & raw materials suppliers like Du Pont, SABIC, Borouge, BASF, Bayer, Dow, ExxonMobil, LANXESS, etc; machinery suppliers like Haitian, Chen Hsong, Husky, Borch, SHI, EDI, Fangli, Liansu, Jwell, Jinhai, Dailian Totani, Demark, Akei, Matsui, Kawata, Wu Xi Yang Ming, Tongyu, Zerma, Avian, Conair, and mould and die suppliers like Mold-Masters, Yudo, etc. Through this platform, every exhibitor will unveil its latest research and development achievements ranging from new materials, processing technologies to final applications. In order to ease the endless stream of visitors, crowd control will be implemented at Entrance Hall 1. Only online pre-registered visitors, badge holders and visitors by invitation are allowed to register or enter Entrance Hall 1 on April 18 & 19 from 9:00 am to 11:00 am. Visitors not of these categories have to register or enter either at Entrance Hall 1 after 11:00 am or Entrance Hall 2 and 3. To enjoy this special admission arrangement, free admission and free coupon to redeem the exhibition catalogue (worth RMB100), please pre-register now at www.ChinaplasOnline.com. In addition, by using the online function of myChinaplas, pre-registered visitors can search exhibitor’s profile, plan visiting route, personalize their own visitor guides and join the online business matching service. Visitors who visit CHINAPLAS from April 18-20, 2012 before 3:00pm will have the chance to win iPad2 or digital camera. For details, please visit www.ChinaplasOnline.com/luckydraw. CHINAPLAS’ mobile website has been launched. Visitors can access CHINAPLAS’ latest show updates, transport and accommodation information, conference details anytime at their fingertips. They can also pre-register online by simply clicking the icon on the phone. For more enquiries, please visit www.ChinaplasOnline.com.